I am fortunate to collaborate with a number of amazing educators who want to completely reinvent high school education. Through this process, I began to notice that school design frequently starts with the class schedule. The air usually begins leaking out of the innovation balloon when this happens and we have some version of the following conversation. Me: Something doesn’t feel quite right, huh? Them: Yeah, I can’t put my finger on it. Me: You are trying to reimagine high school, but your class schedule just laid down dozens, maybe hundreds of constraints on your still emerging school design. Them: What do you mean? Oh. Oh… Oooooooooohhhhhhhh!!! Me: What are your ultimate goals for students in this learning environment? Me: So how about we start there? Put the students at the center of your school design. What experiences would enable your students to achieve these goals? What are students doing? What are adults doing? What happens if we loosen [x] constraint? It is hard to resist the siren call of the schedule. The scheduling process is a combination of science and voodoo and, speaking as a former high school teacher and administrator, few things are more gratifying than getting all the moving parts to fit together. But if you lock down the schedule before you are clear on the experiences you are trying to create for students, you give up a lot of flexibility around time, staffing, personalization, learning modality, etc. All you begin with is constraints. It’s hard to do everything different when you start in the exact same place. There is no cookbook or recipe for innovation. But we do notice some starting points that, at least for now, seem to be more productive than others. Variations of these approaches are found in most books on creativity and innovation (e.g., The Innovator’s DNA , Disciplined Dreaming, and Creative Thinkering). Answering the opposite question: Summit Public Schools is working with its faculty to answer the question, “what would school look like if it were entirely mastery-based and not organized around seat time?” MATCH Education is wondering what a school would look like with only 1:1 tutors. I think about how to build a high school that promotes “passion, purpose, and play” like Tony Wagner suggests in Creating Innovators. Looking at the opposite of what currently exists can generate new insights. There are other ways to modify what exists to create new ideas using the SCAMPER strategy: Substitute, Combine, Adapt, Magnify, Put to other uses, Eliminate, and Rearrange. Drawing a picture: One day we were trying to design different learning environments and decided to draw a picture of 90 students in a room with three teachers and a paraprofessional. We kept drawing different scenarios of groupings, learning modalities (e.g., direct instruction, peer-to-peer, online, independent, etc. ), staffing arrangements, cycle times, to create new learning experiences that were optimized for students and teachers. Before long, we had dozens of drawings and realized there were a seemingly endless number of permutations of how to organize learning. We call these permutations “plays” because our walls began to resemble playbooks in video game football. 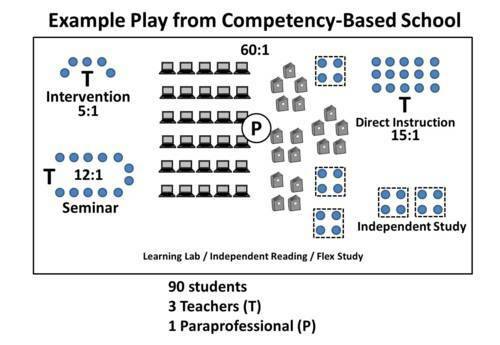 What if these “plays” changed dynamically depending on the desired learning outcomes? For example, the Kunskapsskolan schools in Sweden offer students choices between lectures, center-based instruction, independent learning time and seminars to meet their learning goals. The schools organize staff and students differently (i.e., run different “plays”) to accommodate student preferences for different learning modalities. Through pictures, we can break the confines of 20-35 students in a single room with one teacher and explore new possibilities for learning environments. Focus on first principles: Another approach is to focus on a set of first principles or essential questions to help inform school design. How much ownership do students have over their learning? Is the learning environment radically increasing feedback to students and/or teachers? Is the velocity of learning increasing? What modes of learning are offered to students? How differentiated, personalized are they for different learners? How is the teacher role changing? What is their highest best use? Are you unlocking resources? How are these resources being reallocated? Using the Innosight Institute blended learning taxonomy, it is clear that the different models take very different approaches to the first principles. In fact, one could read a school’s responses to the above questions and predict, with a fair degree of accuracy, what the learning environment looks like. Although there is no straight line to get to the next breakthrough idea, these are examples of processes edu-preneurs can use to move their ideas forward. As I imagine what schools may look like, I bump up against my pre-conceived and ingrained notions of what school has always been – seat time, mandated testing, teacher credentialing, students in rows of desks, classroom management, staffing, custodial needs, and on and on and on. These throw up barriers to any new notion of what schools could actually be. And I know that I am not alone. One of my favorite things about John Danner, CEO of Rocketship Education, is he doesn’t spend a lot of time dwelling on obstacles and constraints. He thinks about the way the world should be and goes after that. In the words of one Rocketship employee, “I have ten things on my to-do list. None of them have ever been done before.” He wasn’t complaining. It is scary to look at a blank piece of paper and imagine what schools can be. It can be like drifting in the ocean and grasping for something to hold onto. I humbly suggest grabbing onto a creative process that leads to new possibilities and takes you to unexpected places. The class schedule is an anchor, not a life boat. Note: My employer, Charter School Growth Fund, is a philanthropic investor in Summit Public Schools and Rocketship Education. I serve on the Rocketship board of directors.